What this is all about . . . So what was that stuff? Chemically, it was ortho-chlorobenzylidene-malononitrile, or C10H5CIN2 for you chemistry majors. Commonly referred to as "CS", it was not a gas at all. According to an article in Army Chemical Review, "In temperate conditions, CS is a fine, white, crystalline powder. When released as an aerosol, as in a pyrotechnic explosion or by burning, CS absorbs moisture. The resulting agglomeration and rapid agent breakdown made for a short persistency duration. Improved versions of CS—CS1 and CS2 …were developed to increase long-term agent effectiveness. Both versions limited moisture absorption and increased persistency from hours to weeks for CS1 and nearly a month for CS2." Developed by the U.S. Army, CS was used in Vietnam—by the South Vietnamese—as far back as 1962. Use by American forces beginning in 1965-1966 was at first limited, not by political considerations, although these would appear soon enough, but by suitable means of delivery. This obstacle was initially overcome by a variety of improvisations and later by specially designed equipment. The first use of CS in a SAR effort was on 9 June 1968. Ultimately, the mission was aborted, precluding a full investigation of CS’s effectiveness, but the potential was obvious. By 1969, the CBU-19 had largely been replaced by the CBU-30, consisting of "the SUU-13 downward ejection dispenser and 1,280 BLU-39/B23 submunitions, each filled with CS. [SUU-Suspension Underwing Unit; BLU-Bomb Live Unit] Upon ejection, a pyrotechnic fuze in each submunition ignited, disseminating the agent into the air." Like the CBU-19, delivery was restricted to below 600 feet AGL to insure ground coverage. "Upon contact with the ground, the submunitions skittered about, disseminating the CS even further. The CBU-30 was compatible with both low and high speed aircraft." Last was the BLU-52, with CS-1 "in a 750-lb. fire bomb casing. Because CS-1 tended to cake when wet, an oil-like substance was added to improve its flow qualities, and the improved fill was called CS-2 and the munition was designated BLU-52A." (Left) A CBU-30 (foreground) on display at the National Museum of the U.S. Air Force. The device illustrated is actually an empty SUU-13, which normally remained with the aircraft after ejection of the CS-loaded submuntions. The A-1 in the background is the aircraft flown by Maj. Bernie Fisher in the dramatic 10 March 1966 rescue of a downed pilot in the A Shau valley for which Fisher was awarded the Medal of Honor. At that time, CS was not yet used in SAR efforts. (Right) A typical "Sandy" A-1 loaded with CBU-30s on the inboard pylons. Outboard are M-47 "Willy Pete" white phosphorus bombs, used to lay smoke screens during SAR operations. (Osprey Publications photo.) Typically, one or more "gas birds" remained on standby until scrambled by the on-scene commander of the SAR effort when the attempted pick-up appeared imminent. As described in the opening section, CS incapacitated the would-be survivor as well as the enemy troops seeking to capture him. But it could also affect the crew of the "Jolly Green" rescue chopper sent in to make the pick-up, necessitating the use of gas masks. But the masks presented another set of problems, restricting the pilot's vision and making intercom and radio communication difficult. Contemporary reports stress the need for a redesigned mask for the SAR crew as well as a one-time mask to be included in survival kits but it is unclear if these improvements were actually implemented. In addition to tactical considerations in the use of CS or other area denial munitions, there were political ramifications. The U.S. was extremely sensitive to charges of chemical warfare which surfaced from time to time. The most sensational of these was made nearly thirty years later by CNN, claiming that in 1970 serin nerve gas had been used against enemy troops during Operation TAILWIND in Laos. These charges were found to be completely false, although it was agreed that some sort of non-lethal area denial munitions, mostly likely CS, had been used. CNN retracted the story and reprimanded or fired veteran war correspondent Peter Arnett and others. In extreme cases, CS and other riot control agents were used to effect, or attempt to effect, the rescue of downed aircrew. Several cases are documented in Project CHECO reports on Search and Rescue in Southeast Asia. 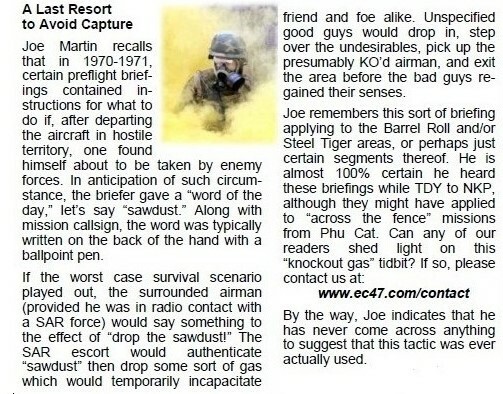 A couple of other ex-EC-47 crewmembers responded to the newsletter article. Charlie Capshaw, a pilot at Pleiku/Da Nang in 1970-71, had this to say: I remember there were code words given out during briefings. For a long time there was a code word for a gas which I understand was much like Tear Gas, but later in my tour there was a second code word for the gas that incapacitated everyone within so many yards of the downed airman--including the airman. We were told we'd be pulled out by SAR. I'll pass your newsletter on to the Intel Officer at Danang at the time, Mike Self. He was the one giving out the codes. More recently, Michael Cimino relates: I was a front ender out of NKP in 1974. We flew missions in Cambodia from Ubon RTAFB. Our mission briefings included rescue provisions exactly as described in the 25 Dec 15 newsletter. Not sure we ever thought it would happen, but it was a standard part of the mission briefs. If you have recollections of these mission briefings, or first-hand knowledge of SAR efforts in which area denial munitions were used, by all means chime in.